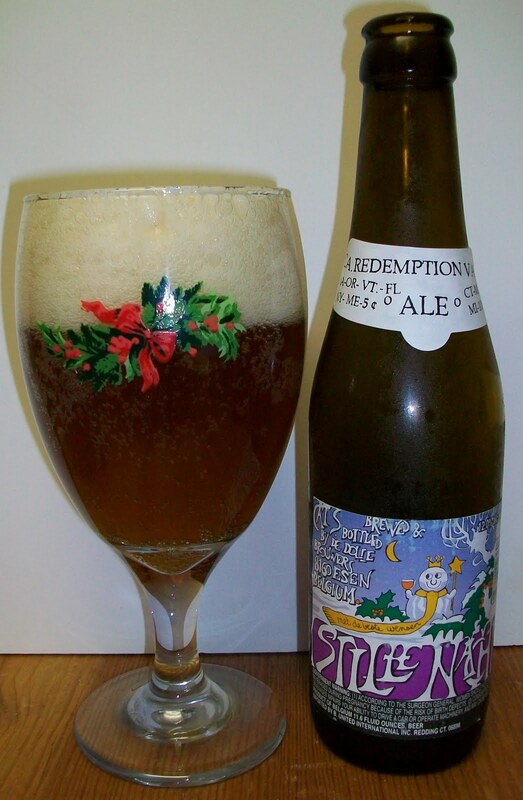 Stille Nacht (Silent Night) is a prestige beer from De Dolle Brouwers brewed for Christmas. It has the highest density of any Belgian beer (27°Pl), has been boiling for 5 hours, brewed with pale malt with white candi sugar in the kettle. The Nugget hops and dry hopping gives an extra bitterness to balance the extreme sweetness due to the density. The taste triangle is completed with some acidity of the fermentation. It is a very interesting beer to age. We have samples of every bottling we have done so far and aging does not mean decreasing quality with this beer. Keep some samples at 10°C and mark the year on the cap with an alcohol marker. Cheers!! Bier Cabinet Spring Cleaning Continues. 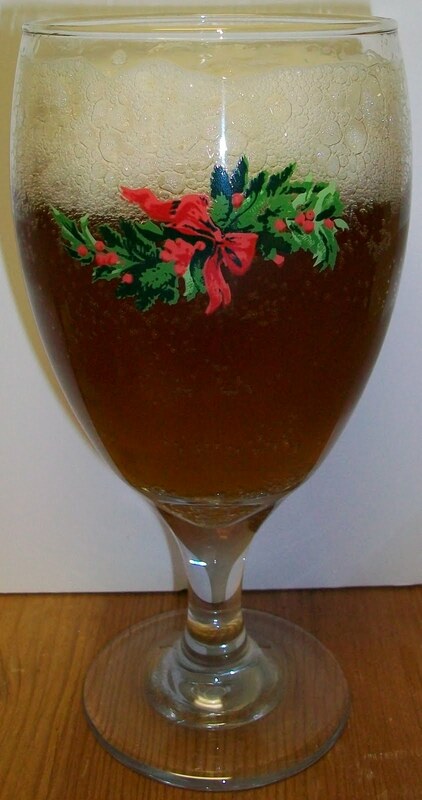 This is a special Christmas Bier. The only problem is that it’s late February early March before we see it in the states. The cap on this bottle is stamped, October 2009. I assume they let it bottle condition before releasing it and then another month or so to get to the states. This is another one of my favorite specialty Belgians. I have not had it yet since starting this blog and have not given it a full review. So let’s see how she holds up. And I just happen to still have a Christmas Glass out, imagine that. The bier pours a slightly cloudy pale amber with ruby almost orange hues and an off white head. The head dissipated fairly quickly. The nose is delightful with rich caramel malt aromas, sweet light hop and alcohol aromas as well with some spicy notes. This is just heavenly. This brew has sweet malts with a somewhat light mouthfeel and the most pleasant warming effect, along with just the right amount of spicy notes. A real masterpiece. Let me attempt a play by play. Sweet caramel malts up front on the tip of the tongue then a dry but very pleasant mid-sip mouthfeel. You can start to detect the alcohol in middle of the sip but just when you think it is going to be overwhelming it levels off at the back-end. There is a very interesting creaminess to the mouthfeel that still carries through enough that it smoothes out the back-end. For a 12% ABV this is very easy going down. Most beers of this ABV have harshness or booziness at the top of the swallow that clinches the throat and makes it hard to swallow. This is just the opposite. There is a velvety smoothness on the back-end that carries through the swallow and allows this 12% nectar to glide down the throat effortlessly. There is also the most comforting warming effect as it goes down. It stays smooth and creamy through and through. The finish is very dry with some spicy notes and an almost citrusy aspect to it. The final aftertaste is an exquisite mixture of creamy malts light hops, along with some spice and fruit notes. You are left with the most interesting creamy coating throughout your mouth. Wow, this is really good. Vanilla Cream Soda just popped into my head. This bier is like an adult version of that childhood favorite. Remember as a kid how it left that sweet creamy coating in you mouth; unlike any other soda. That is what this bier reminds me of. Yeah, I know, I’m out there. There is also an odd refreshing quality to this bier. Or this brew may just be hitting that comfort zone for me. At any rate it is very enjoyable and relaxing. This is warming nicely also. I don’t have my thermometer but this one is getting pretty close to room temperature and it is just exquisite. It really seems to be getting smoother as it warms. I would have thought that the alcohol would make this a little harsher at these temperatures but it hasn’t. The final few sips were warmer then room temperature. I purposely held the glass to warm the bier a little. The outcome was amazing! This in another one of the “Beer Liqueurs” well in this case it’s a “Bier Liqueur”. Those final sips were silky smooth, creamy, and warming. This bier will go in the same category as Samichlaus and World Wide Stout as excellent warmers. And I mean warm, like 75 plus degrees. A+ for Stille Nacht; an exquisite Belgian Christmas Ale for any season. Even for May this is a perfect nightcap beverage. This is one of those specialty beers that you just have to treat yourself to once in a while. It is a Strong Ale so it’s not for everyone but then again what beer is for everyone. I highly recommend that you pick up a bottle while it’s still around and same it for next Christmas. Man O Man I’m so glad I did not pour these lees into this bier; these would have drastically changed my experience. For lees these were not bad but there is an odd bitterness and of course a yeastiness that I did not experience in this bier. So once again PLEASE save the lees for later.